From citrusy beer cocktails to refreshing cucumber margaritas, here are seven super fast cocktails that are perfect for happy hour. Star mixologist Jim Meehan makes this delicious strawberry cocktail with Death's Door White Whisky. 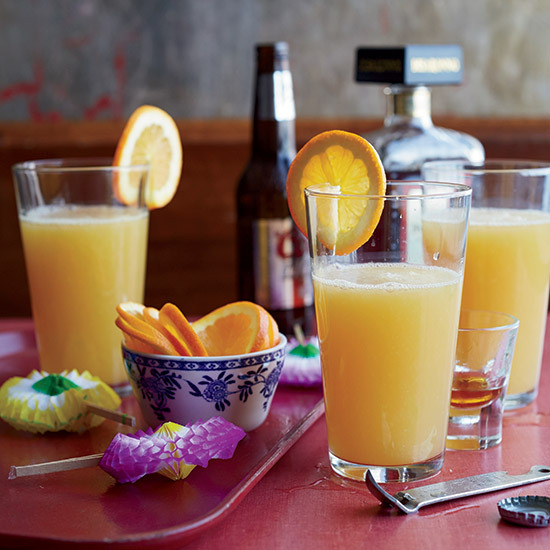 This unusual-yet-delicious drink requires just three ingredients: fresh orange juice, amaretto and light beer. Bobby Flay's take on a Southern julep features a refreshing ginger-mint syrup. Smoky mezcal, fresh grapefruit juice and Cocchi Americano (a sweet Italian aperitif wine) star in this version of the classic Mexican Paloma cocktail. Kiwi and citrusy Viognier pair well in this refreshing, gin-based cocktail recipe. This lively drink is made with Japanese whisky. Upgrade the classic margarita with cucumber-infused tequila.